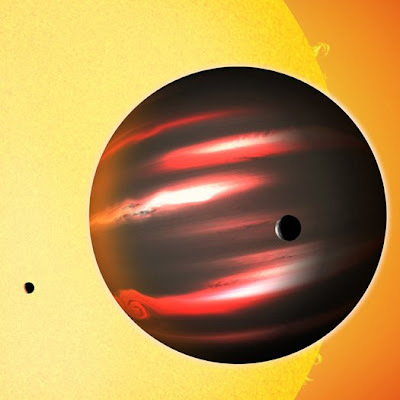 The Darkest known planet discovered by astronomers, it is called TrES-2b, it about the size of Jupiter, revolves around the star GSC 03549-02811 something like 750 years light-years away. According to scientists, this planet reflects only 1 percent of the light that hits it, this makes it by far the darkest known Planet ever detected in the universe. "And darker than coal, the darker the paint darker than you can imagine," said David Kipping, an astronomer at the Harvard-Smithsonian Center for Astrophysics. One explanation would be the lack of clouds, planets of this size that help to reflect light. To keep away the clouds is the temperature of the TRS-2B, 980 degrees Celsius. According to scholars, however, none of the chemical elements we know more than just explain the lack of light. That 1 percent of light that can reflect consists of reflections of a very pale red. The discovery of TrES-2b is one of the wonders of the cosmos that we saw with the launch of the Kepler spacecraft: its journey began in March 2009, expected to close in November 2012.